Agriculture, Art and Photography, Beauty, Blogsite, Business, Cafe and Restaurant, Christmas, Computer, Dating, Design Studio, Educational, Electronics, Fashion, Flowers, Food and Drink, Games, Gifts, Hotel, Industrial, Interior and Furniture, Jewellery, Media/Entertainment, Medicine, Motor/Car, Music, Night Club, Personal, Photogallery, Real Estate, Sport, Telecommunication, Transport and Travel. offer your customers a modern web experience with NO programming. 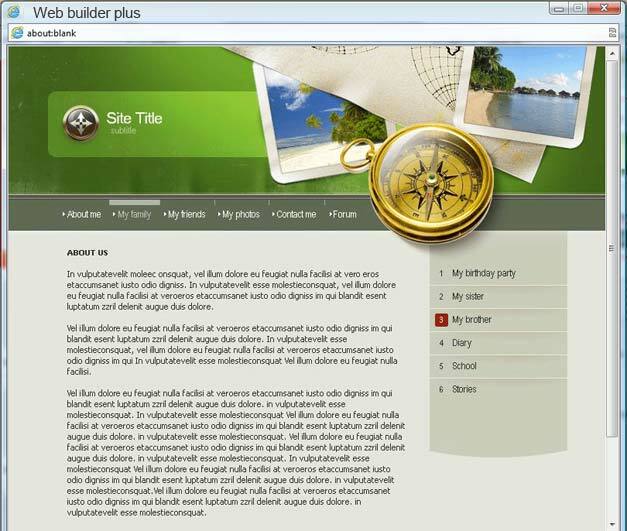 The demonstration files you create using Web Builder Plus can be returned to. However after a period of time the temporary web is deleted.